Disclaimer: some people do perfectly fine on very low-carb or ketogenic diets for years and years. If that’s you, great! But if that’s not you, then you might find something useful here. Frustrated by low-carb? Did it stop working for you, or maybe you’re just tired of the intense restriction on everything from carrots to kale? It might be time to try a different tack: instead of focusing only on carbs, try a more rounded Paleo approach. Carbohydrate level Low Variable; low to medium. Is soy sauce (containing wheat) allowed? Yes, since the tiny amount of carbohydrate is negligible. No, since wheat is a gut irritant. Is canola oil (containing lots of Omega-6 fats) allowed? Yes, since it has no carbs. No, since Omega-6 fats are inflammatory and unhealthy. Are sweet potatoes (containing significant amounts of carbohydrate) allowed? No, since they have carbs. Yes, since they are full of nutrients and do not contain any toxins or gut irritants. Is tofu (containing soy) allowed? Yes, since it has few carbs. No; soy is full of inflammatory Omega-6 fats and other problems. Is dairy allowed? If it’s full-fat, to minimize carbs. Maybe, if you personally tolerate it well. You can eat a healthy low-carb diet or a junk food low-carb diet. You can eat a low-carb or a moderate-carb or even a high-carb version of Paleo. There’s a lot of overlap, because Paleo tends to be lower in carbs than a typical American diet, but they’re not even close to the same thing. If you want to switch from generic low-carb to Paleo low-carb, it’s pretty simple: just get rid of any vegetable oils, grains, legumes (including soy), and processed junk in your diet (if you were eating it in the first place). But if you want to try adding in more “safe starches,” it gets a little more complicated. So this article is really for people who were on a low-carb diet – whether it was keto, Atkins, or a generic low-carb diet of your own invention – and want to try a moderate-carb version of Paleo instead. Why Would you Want to Switch? You went low-carb to lose weight, but it stopped working. You successfully lost weight on low-carb, but now you have other health issues that you’d also like to address with diet (e.g. acne). 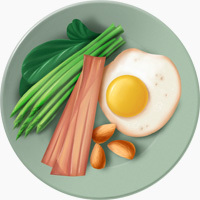 You went low-carb to resolve some health issue, and it cleared up partway but isn’t entirely gone. You went low-carb, but your workouts went down the drain. You tried low-carb, but you were constantly hungry, grumpy, miserable, or low-energy. (women) Low-carb dieting had negative effects on your period or fertility. Low-carb just doesn’t work for everyone, and it’s not because you’re doing it wrong! All vegetable or seed oils (including canola/rapeseed, peanut, and soybean oil). Acceptable cooking fats on Paleo are animal fat, olive oil, coconut oil, and other healthy plant fats. All artificial sweeteners and low-carb processed food. Fruit, including starchy fruit like bananas and plantains. Instead of eating a big pile of cheese on your salad, try a banana on the side. Instead of an avocado with dinner, try a sweet potato. Eating carbs with fat and protein will minimize any blood sugar issues, and help you slowly work up to a level of carbs that works well for your own body. Water weight. You may gain 3-5 pounds of water weight (this is not fat!) because carbohydrates make you retain a little more water. Don’t freak out about it. Really. Retaining water is not the same thing as putting on fat. Either a gradual or a sudden increase in energy and mood. An almost uncomfortable kind of “nervous energy” or very strong drive to do something right now. Often this comes along with an inability to sit still (this should fade as you get used to eating more carbs). Strange energy highs and crashes. Better athletic performance, more focus in the gym, and higher endurance. Most of the undesirable effects on this list will iron themselves out over a week or two; just give it time. Hunger changes. You may feel either more or less hungry than usual. You might also find that your meals suddenly seem “too big” (because carbs are much less energy-dense than fat, so the same number of calories will physically take up more room on the plate). Other changes. Everyone’s body is different. Some people have digestive changes or a period of adjustment to eating more carbs and fiber (this isn’t always negative either: eating more carbs sometimes helps a lot with constipation). Other people just keep running right along without a hitch. It’s hard to compare low-carb and Paleo, because there are so many different varieties of both. You can eat a low-carb diet that doesn’t come close to Paleo, and a Paleo diet that doesn’t come close to low-carb, but you can also eat a low-carb Paleo diet if that’s what works for you. Most whole-foods low-carb diets are fairly close to Paleo anyway, so in practice many people restricting carbs are already almost Paleo. Which one is “better”? That’s up to the individual person. The point of this article isn’t to persuade anyone to “switch teams:” it’s just an outline of why you might consider a change, and how to go about it if you decide to take the plunge.